Basic Income Network Italia (BIN Italia) has released a new editorial production. 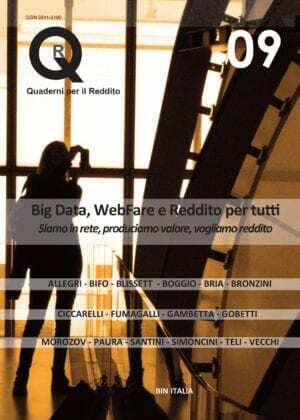 Titled “QR9 (Quaderni per il Reddito) – Notebooks for Income: Big Data, WebFare and basic income for all! We are on the net, we produce value, we want basic income“, it’s freely accessible over the Internet. This publication (March 2019) features 16 authors, offering different perspectives thanks to an included variety of articles written by several italian and international authors. As reported in the back cover: “Today the Capital expresses its value and lives within neurons and silicon and this evolution changes the relationship between Labor and Capital. Identifying a sort of WebFare Manifesto, could mean a new speech to claim an unconditional basic income, the fruit of our being connected to the network”.